Keith is well-known as an engaging and entertaining speaker, and he is a leader and innovator in the use of stable isotopes to track bird migrations. For the last decades, I have been working on the use of chemical fingerprints (stable isotopes) primarily in bird feathers to provide geographic information of origins of birds. The advantage to such an approach is that only one capture is required and sampling is not biased to the relatively few locations where birds can be marked, such as banding stations. This approach has provided a breakthrough in the way we can track wildlife. I will provide an overview of this technique and provide many examples from birds to butterflies. I will also cover off some exciting new developments on the use of light-sensitive geolocators and other devices that are becoming ever smaller and useful for migration studies. Dr. Hobson is a senior research scientist with Environment Canada in Saskatoon and an adjunct professor in Biology at the University of Saskatchewan. 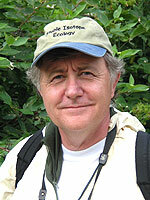 He has pioneered the use of stable isotope tracers in avian studies and has published over 400 peer-reviewed scientific papers and book chapters.